The original Gateshead AFC was formed in 1930 when neighbours South Shields, members of the Football League’s old Third Division North, moved to Gateshead because of financial difficulties. The newly formed ‘Tynesiders’ almost capitalised immediately on their good fortune when only Lincoln City’s superior goal average denied them promotion to the second division in just their second season of League football. However, it was to be the FA Cup that was to provide the club with its finest hour when cup fever gripped the Tyneside town in 1953. After accounting for Liverpool in the third round, Gateshead progressed to the quarter-final only for their Wembley aspirations to be denied by a single Nat Lofthouse goal for eventual finalists Bolton Wanderers. A sell-out Redheugh Park crowd of 17,692 had witnessed the spectacle, but within five years the North Easterners were founder members of the newly formed Fourth Division after they missed the cut for the Third Division by just one point. Despite an average placing of 9th in 21 Third Division North campaigns, interrupted by the second world war, two years after the introduction of the Fourth Division came Gateshead’s shock dismissal from the Football League. The club had applied for re-election only once before in a relatively successful 30-year period, but were unceremoniously cast aside in favour of the more geographically favourable Peterborough United in 1960. Gateshead had finished third bottom with both Oldham Athletic and Hartlepools United below them, but polled only 18 votes and were unjustly voted out of the League. An unsuccessful bid to join the Scottish Football League was followed by a brief spell in the Northern Counties League and then six years in North Regional League. In 1968 Gateshead became founder members of the Northern Premier League, but their stay in the new competition lasted only two years. Their place was, ironically, taken by another demoted Football League outfit, Bradford Park Avenue, and Gateshead were forced to replace their own reserve side in the Wearside League. Finishing as runners-up the Tynesiders then had two seasons in the Midland League until in 1973, seven leagues and 43 years after its inception, Gateshead AFC ceased to exist. A new club called Gateshead Town played the following season in the local Northern Combination League but, astonishingly, history was soon to repeat itself. South Shields, then members of the Northern Premier League, sold their Simonside headquarters and moved to a new home at Gateshead Stadium. Renamed Gateshead United the club soon became a force in the Northern Premier League while accounting for Football League clubs Grimsby Town and Crewe Alexandra in the FA Cup. However, in 1977, after only three years of operation, came the shock announcement that United were to disband – the third body blow to hit Gateshead supporters inside two decades. It looked like the end of senior football in the town until another phoenix, this time in the form of the currentGateshead FC, rose from the ashes in 1977. Replacing Gateshead United in the Northern Premier League for the 1977-78 season the new club won the Championship in 1983 with a record 100 points and 114 goals. After two years in the Conference, the Tynesiders returned to the Northern Premier League and lifted the title for the second time in 1986. Their second spell in the Conference lasted just one season, though they were quick to bounce back, and reclaimed their place at the top table of non-league football in 1990. The accustomed role of top flight strugglers was transformed with 7th and 5th place finishes in successive campaigns, 1994/95 and 1995/96, as well as three quarter-final appearances in the FA Trophy in four seasons. A productive period ended in 1998 when the club was relegated back to the Northern Premier League after eight consecutive seasons of Conference football. The Heed’s very existence was then threatened early in the new millennium when long-time sponsors Cameron Hall Developments pulled out. Relegation to the Northern Premier League 1st division followed but, after one season, Gateshead were back in the NPL top tier following the introduction of a geographically split 1st division. The future for a club with a proud, if somewhat chequered, past took a turn for the better when wealthy Gateshead-born businessman, Graham Wood, took over in 2006. Gateshead finished third in the UniBond Premier division, NPL, in 2007-8 when they were joint-top goalscorers in the top ten divisions of senior English football, including the Premiership and Football League. Back-to-back promotions were achieved when the rejuvenated Tynesiders claimed runners-up spot in the Conference North, where they finished joint-top scorers with 81 goals. Gateshead beat AFC Telford United 1-0 in the Conference North play-off final in front of a 4,000 plus crowd on Tyneside to reach the Conference Premier. The first campaign back in non-league’s elite division, 2009/10, proved to be a difficult one with top flight status only retained on the final day of the season on goal difference. 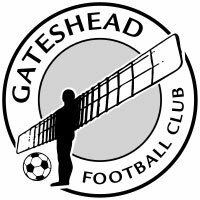 Gateshead then marked the 50th anniversary of their harsh expulsion from the Football League by again becoming a full-time professional club in 2010. The following season brought a 14th place finish and a place in the semi-final of the FA Trophy for the first time, the Heed then finishing 8th in 2011/12 while reaching the last eight of the Trophy. The next campaign, however, saw chronic pitch problems at the International Stadium, which resulted in half of their home games being staged at seven different grounds – and 17th place in the table. Last season, however, Gateshead recorded their highest placing in English Football since their Football League days and reached Wembley for the first time in their 84-year history. The Heed finished third and attracted their biggest crowd for a competitive game at the International Stadium, 8,202, for the play-off semi-final second-leg win over Grimsby. They had reached the Conference Premier play-offs for the first time, but hopes of reclaiming League status after more then five decades ended at Wembley in front of a near 20,000 crowd in May. Gateshead lost the Conference Premier Promotion Final 2-1 against Cambridge United – and will now look to go one better in 2014/15.